L.A. Story. Carolco Pictures, 1991. Five years ago, on December 4, 2009, Yesterday’s Movies officially began. To celebrate half a decade of movie reviews, I’m rewatching some of the highlights and giving them second-look reviews. I’m kicking it off with a look back at the best reviewing experience I had, L.A. Story. As I recall, I’d heard the film spoken of glowingly, but never expected it to be much more than one more copy-paste romantic comedy. I didn’t expect the amount of fun, warmth, and satire, and I certainly didn’t expect the element of fantasy. At this point the main thing I remember about the plot is that Steve Martin falls in love with a woman he probably shouldn’t. Also there’s a cameo with Patrick Stewart. I’m concerned that it won’t be as good as I remember, simply because so much of my impression was born from the gulf between what I expected and what I actually saw. Harris Telemacher is the Wacky Weekend Weatherman in Los Angeles, where it’s always sunny and 72. His girlfriend of many years, Trudi, is on an entirely different wavelength from him, and he’s too busy being happy to realize how miserable his life is. Until one day at a social lunch, he meets Sara, a London journalist in town for a story, and is deeply smitten. But since he’s in a relationship, he doesn’t pursue her. He does however start seeing a free-spirited 23-year old named “SanDeE*” who’s in an open relationship. Once Trudi reveals she’s been cheating on Harris for years, he’s a blissfully free man, and with the encouragement of a traffic condition sign, Harris begins to go after what he really wants. There are so many layers to this movie. It’s surreal, it’s satire, it’s a love letter to a city, it’s wild and crazy, it’s deeply philosophical, it’s magical, it’s complicatedly real. It’s written by Steve Martin, and it is complete brilliance. It’s hard to imagine another work that can combine poignancy, humor, surrealism, and modernity so expertly, and then I remembered Martin’s book of short prose and poems Pure Drivel, which is very similar in unclassifiable tone, and I realized that Steve Martin may be an even better writer than he is a comedian. I love the version of L.A. this movie creates, I love the light touch of magic, I love the crunchy emotional complications of the relationship polygon, and I love that they exist so impossibly together. I think I noticed more satire than before, and I identified with the locale more, having lived much closer to the same latitude and climate for the past few months. I didn’t even notice last time that Rick Moranis’s cameo is a wholesale homage to Hamlet, rather than just quoting it halfway. I got this movie on an even deeper level than I did four and a half years ago, and there is so much depth to grasp. Looking back at my first review (linked above), it feels less like a review and more like a recap, which is a tendency I thought at the time I’d long since quashed. I describe several of the jokes, which I try to avoid as much as I try to avoid describing how the movies end, since the element of surprise is such a large part of the first time experiencing a punchline. At least I didn’t describe any of my actual favorites. I was also unnecessarily down on Sarah Jessica Parker, which I recognized almost immediately after and kept in mind when I reviewed another film she was in. I’d like to say it was because I felt I had to have some degree of criticism in such a glowing review, but it was mostly influence from a show I’d recently seen that made a lot of jokes about her appearance. I now respect her work in this movie as the spirit of young, trendy L.A. and as the complication in Harris’s pursuit of Sara (which is still a little bothersome, but I accept it thematically). I was worried I was setting myself up for a disappointment, but if anything, my admiration for this film has increased. It’s not as enthusiastic, because there’s no surprise to the wow factor, but it still impresses. For a long time, when asked my favorite movie, my answer was a placeholder. I wasn’t sure I really liked anything better in a long-term way, but after ten years of giving that answer, I wasn’t sure I wouldn’t rank anything higher. I think I have a new all-time favorite movie. 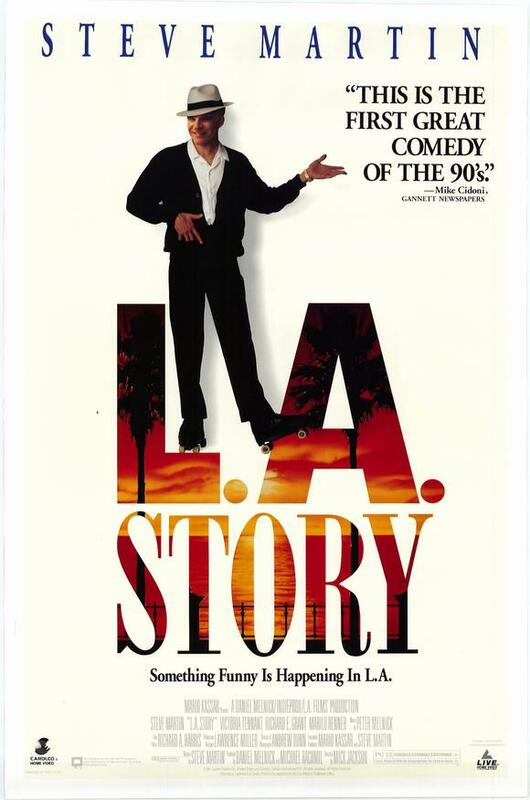 L.A. Story may not be the truth, but it is what we wish were true.